If you have a garden, or if your neighbor has a garden, there’s a good chance that you are staring down a pile of cucumbers. This time of year, the novelty of fresh cucumbers has worn off just enough that simply salting them and placing them on a plate for a snack or side is no longer enough. The days of enjoying the crisp light flavor is over, now you need to make your way through them and get everyone else in the neighborhood to do the same. I picked a few from my mom’s garden this weekend, each one so long that when lined up on the countertop it looked like I was manufacturing temporary peg legs for vegan pirates. Long cucumber story short: we have a lot of cucumbers. Many cultures have dishes that combine cream and cucumbers. 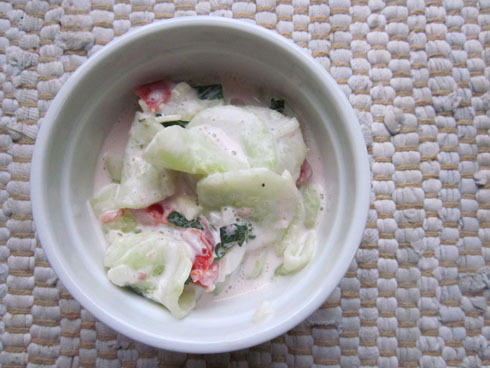 One of my favorites comes from my friend Sevda’s mom, who makes a dish with wilted cucumbers, cream and sugar. It is deliciously light in flavor, but not all that low in calories. I decided to start out with the same basic approach used in that dish by wilting the cucumbers in salt slightly before assembling the final dish. To make the dish a bit healthier, I used fat-free Greek yogurt in place of the cream – this added a bit more body, a slightly sour flavor, and some protein to the dish. And as long as I was making changes, I decided to add some flavors from traditional Turkish cucumber dishes, and threw in some mint and garlic. The resulting recipe no longer resembled either sources of inspiration, but was a tasty compilation. Place the cucumbers in a bowl and sprinkle with salt, stir to combine. Place in the refrigerator for 30-60 minutes so that the cucumbers will wilt slightly. Rinse thoroughly, and then drain excess liquid. Add remaining ingredients and stir to combine. Salt and pepper to taste. Just made this today – delicious! Well, when I say I made it… I thought I had everything, turns out I was out of Greek yogurt, so I through in 1/2 c mayo and a splash of vinegar – for tartness. Raw onion doesn’t always like me so I only used about 1/2 as much onion and grated really fine. Not sure if I had quite 2 T of fresh mint… But it is delicious! Thanks for sharing – keep the recipes coming! Okay, I guess I forgot the garlic. Maybe I will go put some in to what is left. So, I kind of made this… It was really good though!